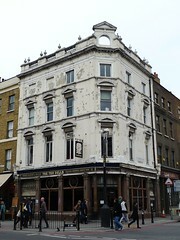 Historic pub situated in Spitalfields between Liverpool Street and Brick Lane, which features in many a Jack the Ripper walking tour. These days it's kitted out with leather sofas and small tables, and as it's quite small can get very busy after work at the end of the week. Most of the drinkers are young people from the recently gentrified areas around Commercial Street. The decor is some lovely 19th century tiling which extends around the whole place, giving it an excellent ambience, so despite the crowds it never really feels unpleasant. They have only Bombardier on tap (as well as Leffe and the other standard lagers), but also bottles of St Peter's Golden Ale (£3.10) amongst others. The lime and soda is a whopping £2.60 but very good for all that. Gin and tonic is £2.90 (though I managed to get soda instead of tonic, disappointingly). They were advertising a music pub quiz for Monday in July (and it seems to be a regular thing, perhaps the first of each month). Last visited by Ewan and others, 20 February 2009. Opening hours taken from Time Out website, April 2008. Last edited 2011-06-26 14:40:53 (version 13; diff). List all versions. Page last edited 2011-06-26 14:40:53 (version 13).